Since 2005, Opening Ceremony Collection has captured the youthful and forward-thinking aesthetic that defines the company as a whole. With a focus on innovative prints and fresh, modern silhouettes, each season takes its wearers on a journey of discovery. Drawing inspiration from diverse worlds—modern dance, street-racing culture, the art of René Magritte—collections fuse experimentation and wearability. 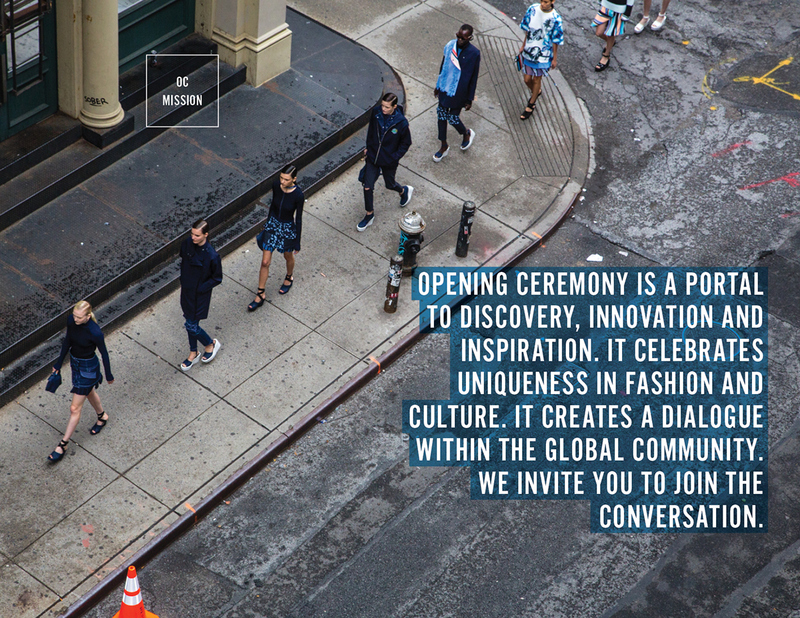 Incorporating knits, dresses, accessories, denim, handbags, and footwear, the Opening Ceremony Collection is currently sold in over 200 stores worldwide. At the heart of Opening Ceremony’s storytelling are collaborative design partnerships, which connect creators across the worlds of art, fashion, music, and film. These special projects are a defining aspect of Opening Ceremony’s business model, with the brand advising every step of the way—from design to production, distribution to market. Featured collaborators include Chloë Sevigny, Intel, New York City Ballet, Pendleton, Spike Jonze, and Yoko Ono. Since 2005, Opening Ceremony Collection has captured the youthful and forward-thinking aesthetic that defines the company as a whole.